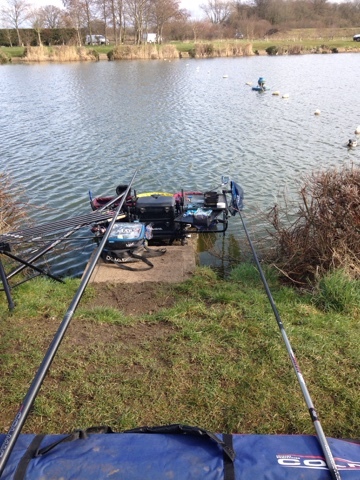 Liam Dennick Fishing : Sunday 6th March. 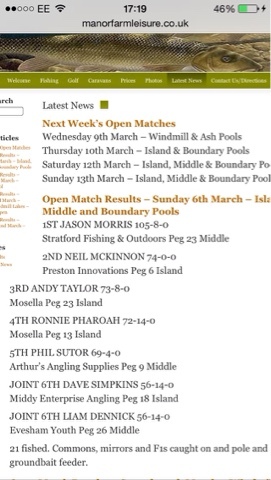 Manor farm open - peg 26 Middle. Middle pool can be cruel at times and you just don't know where the fish are gonna be. With this in mind my approach was dead simple. Stared on the bomb and had 3 fish in first hour. A quick switch to the pole saw me have a few more fish and going into the last 2 hours I was struggling. So I fed my pole line and hoped they'd rock up on it late. Last 30 minutes saw a quick flurry of F1s. I managed to weigh 56-14-0 putting me joint 6th overall.